No giveweys, just a dream. I like this thread. Thank you for making it. 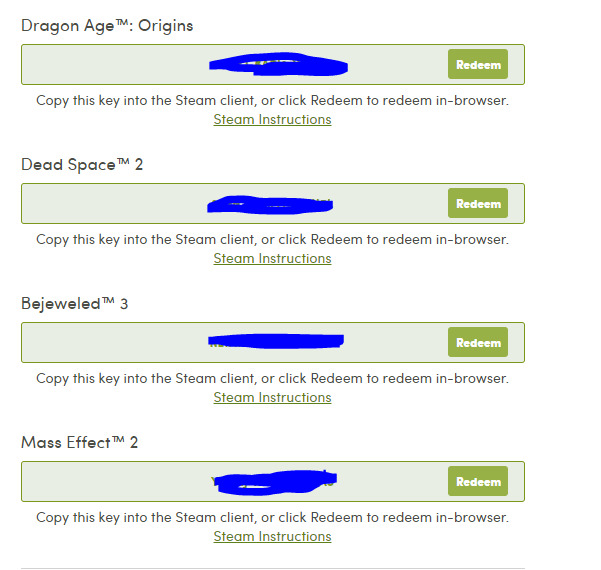 I often saw Dead Space 2 and Mass Effect 2, being given away at the same time. And Dragons Age Origins. Does anyone know from where? I missed it, started buying games at december 2015, so missed a lot of good bundles. Where are the DGU giveaways coming from? Pizza Connection , Where do they come from? Is there a deal on Death Road to Canada right now? Just saw a few posted recently and haven't seen it before. Any idea where are Love in the Glen keys coming from? SakuraGame new game promotion, and could be from a bunch of previous bundles. If you read comics you get 350 coins per comic. chance on junk is high. Yeah read them all and opened loot pack about a dozen times and all junk! Bought 5 Card Realms card game at gamers gate for 1 buck... not Steam key but sure is a fun solitaire game! Thanks for sharing this! I got Crash Time II, In Vitra and Fantasy Quest Solitaire ! when I logged in on lootboy.com and opened two card packs i didn't get the game. But after I downloaded the app and logged in there I suddenly had it in my inventory. Finally got one after shredding cards and gathering more coins and opening more loot packs! Just stopping by to say, great idea for a thread and thanks for making it. I was interested in Fantasy Solitaire Quest, and after reading that the game can be obtained from https://www.lootboy.de I tried my luck in that place. I wasn't lucky (obviously :P) and after reading all the comics (some of them were really funny ^_^) and got enough coins to keep trying my luck with the LootPack, after a while I got 3D Chess, which was the only thing worthy of the time spent... the rest were only discount coupons and codes for F2P online games not on Steam. Still need it? I have an extra, sent you a friend request on Steam. Hey, is that site really legit? No idea how legit it is (I have been wondering that; I did see a thread on the Drakensang forums at least where it was said they're an official partner), but free Steamkeys for a bit of clicking around was good enough for me. So you get games by earning points? Can you tell me what is the lootpack that may give you games? I only see one that says it gives cards. You can open it every time you have at least 2000 coins. Keep reading comics until the end, each one gives you 350 coins. Sometimes you get more coins just for opening that LootPack as a reward. Without not much effort, you should be able to open it at least 6 or 7 times. Thanks for the link. Got 3D Chess and Fantasy Quest Solitaire for me and Starlaxis for a friend. You can also shred loot cards for 10-100 extra coins. I did this with all the coupons and f2p game content. After all the comics you mayhave enough for an extra pack. Shred loot cards? Interesting, I didn't know that. I'll try it later. Thanks! Click on a card from your inventory and then there's an action drop-down menu in the top right, the options in there. Thanks a lot! Got 3D Chess and Fantasy Quest Solitaire. Oh, I thought they were already expired. Thanks! I see some gtav giveaways sometimes, but people keep saying that gtav steam keys don't exist. Is this true and they're putting incorrect keys? Or are there some form of them. There's also the off chance it's a steam gift, but I doubt it. Sorry, I meant when I said I doubt it is that I doubt every gtav giveaway is a steam gift. Also, thanks for the info. When you see a GTA V giveaway, look at the stats for the user. Most of the time, it's an account that was recently created, and has almost no site activity. That means that more than likely, the giveaway is fake. It's someone trying to game the system and raise their level quickly, who think the site admins and users are stupid. As far as I am aware, GTA V is only sold in downloadable form directly via Steam or Rockstar itself, and there are NO Steam keys. It's either a direct Steam purchase or gift, or a Rockstar key. And since the product has various kinds of region restrictions, but most of the giveaways don't, you also know that the person supposedly giving it away doesn't know or doesn't care, which is another red flag. So even if they were planning to give a Steam gift, it's unlikely that it would activate unless the winner lived in the same region, and with price differential restrictions in place now on gifting, the same country. I'm seeing these three pop up a lot, especially through the last few days. I know Fake/SuperSonia was part of a promotion maybe a month ago, but that had died down and the games are starting to resurface again. If anyone knows, let me know! Thanks. Just the last / I forgot to remove. Viki Spotter? I know it's fairly cheap on Steam, but is there a bundle/deal somewhere? Ah, wasn't aware of that. Thanks! Sumeru? Seen a couple of giveaways lately, even before the sale. Gray Matter flood right now. Is it free somewhere? Is Monster Slayers in a deal somewhere now?